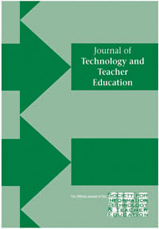 This special issue of JTATE comes at a time of rapid growth of K-12 distance education in many parts of the world, especially the USA, where it is known as Virtual Schooling (VS). A growing body of research indicates that we are not prepared to educate educators for this twenty-first century phenomenon that has multiple impacts on the teaching and learning process, teacher education, and the leadership of primary and secondary schools. This editorial by two leaders in this field sets these highly original papers within a global context and the field of teacher education. The papers cover a range of the process of professional development including the raising of awareness, preservice field experience, recruitment of VS and standards for online educators. Many authors call for changes within teacher education. Davis, N. & Ferdig, R.E. (2009). Editorial: What Is Special About Teacher Education for Virtual Schooling?. Journal of Technology and Teacher Education, 17 (4), 425-435. Waynesville, NC USA: Society for Information Technology & Teacher Education. Retrieved April 22, 2019 from https://www.learntechlib.org/primary/p/30484/. Bradley J. (Ed). (2003). The open classroom. Distance learning in and out of schools. London: Kogan Page. Cavanaugh, C. S. (2001). The effectiveness of interactive distance education technologies in K–12 learning: A meta-analysis. International Journal of Educational Telecommunications, 7, 73–88. Charania, A. (2009). Are preservice teachers ready for virtual schooling? Manuscript in preparation. Compton, K.L, Davis, N.E., & Mackey, J. (2009). Field experience in virtual schools— To be there virtually [Special issue]. Journal of Technology and Teacher Education, 17(4), 459-478. Davis, N.E. (2008). How may teacher learning be promoted for educational renewal with IT? Models and theories of IT diffusion (pp 507-520). In J. Voogt & G. Knezek (Eds. ), International handbook of information technology in primary and secondary education. Amsterdam: Springer. Davis, N.E. (2009, March). The co-evolution of information technology and education—It has to be taught! Keynote address at the Society of Information Technology and Teacher Education Conference, Charleston, SC. Davis, N., & Niederhauser, D.S. (2007, April). Virtual Schooling. Learning & Leading with Technology, 34(7), 10-15. Dewstow, R., & Wright, N. (2005). Secondary school students, online learning, and external support in New Zealand. Computers in the Schools, 22(1-2), 111–122. Ferdig, R., Cavanaugh, C., DiPietro, M., Black, E., Mulkey, J., & Dawson, K. (2009). Virtual schooling standards and best practices for teacher education [Special issue]. Journal of Technology and Teacher Education, 17(4), 479-502. Fulton, K. (2002). Preserving principles of public education in an online world: What policymakers should be asking about virtual schools. Washington, DC: Center on Education Policy. Goodlad, J. (1994). Educational renewal. San Francisco: Jossey-Bass. Hannum, W.H., Irvin, M.J., Lei, P.W., & Farmer, T.W. (2008). Effectiveness of using learner-centered principles on student retention in distance education courses in rural schools.Distance Education, 29(3), 211–229. Hirtz, S. (2008). Education for a digital world: Advice, guidelines and practice from around the world. Vancouver, BC: BC Campus/Commonwealth of Learning. Laferriere, T., Breuleux, A., & Erikson, G. (2004). Telecollaborative communities of practice in education within and beyond Canada. In A. Brown & N.E. Davis (Eds. ), Digital technology, communities and education. World Yearbook in Education 2004. London: Routledge. Lai, K.W., & Pratt, K. (2004). E-learning initiative. An evaluation of the OtagoNet project. Dunedin, New Zealand: University of Otago College of Education. Lewin, C., Whitton, N., Cummings, J., Roberts, R., Saxon, S., Somekh, B. & Lockwood, B. (2008b, July) MILO: Models of innovative online learning at Key Stage 3 and 14-19. Deliverable 4: Final report appendices. Report to BECTA. Manchester, UK: Centre for ICT, Pedagogy and Learning, Educational and Social Research Institute, Manchester Metropolitan University. Pape, L. (2004). Choosing online education: Good policies will lead to better decisions about virtual learning options. School Administrator, 61(4), 5. Roblyer, M.D. (2003). Virtual high schools in the United States: Current views, future visions. In J. Bradley (Ed. ), The open classroom. Distance learning in and out of schools (pp. 159-170). London: Kogan Page. Roblyer, M.D. (2008). Virtual schooling. In J. Voogt & G. Knezek (Eds. ), International handbook of information technology in primary and secondary education. Amsterdam: Springer. Stevens, K., & Moffatt, C. (2003). From distance education to e-learning: The organization of open classes at local, regional and national levels. In J. Bradley (Ed. ), The open classroom. Distance learning in and out of schools (pp. 171-180). London: Kogan Page. Ultralab. (2001). Not-School.NET: Research phase final report December 2001. Chelmsford, UK: Anglia Ruskin University. Watson, J. (2008, Fall). Online learning: The national landscape. Threshold, (pp. 4-9). Watson, J., Gemin, B., & Ryan, J. (2008). Keeping pace with K-12 online learning: A review of state-level policy and practice. Vienna, VA: North American Council for Online Learning. Zhao , Y., Lei, J., Yan, B., Lai, C., & Tan, H. (2005). What makes the difference? A practical analysis of research on the effectiveness of distance education. Teachers College Record, 107(8), 1836-1884.